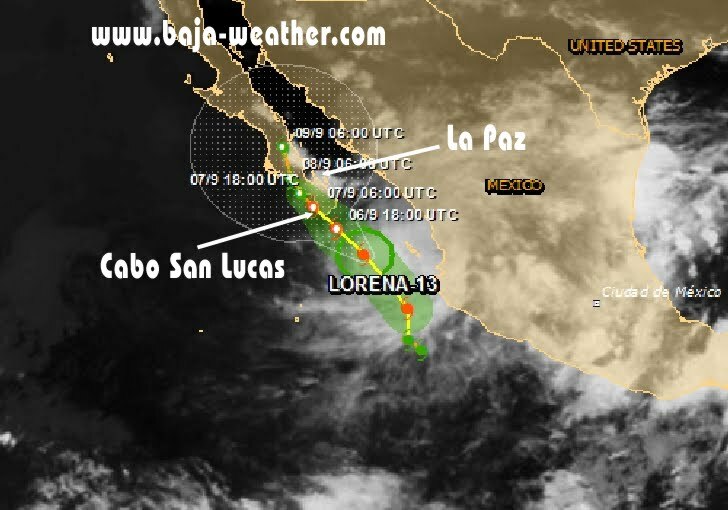 Lorena is approaching Baja California Sur. At 5:00hr PDT the location of tropical storm "Lorena" was 21.9n 108.9w, about 155km / 95mi SE of Cabo San Lucas, Mexico. Present movement NW or 315 degrees at 22 km/h. The storm with so far maximum sustained winds early Friday near 65km/h (40mi) with little change in strength expected until landfall, which is expected either late Friday or on Saturday in southern Baja California. The tropical storm is expected to continue toward the northwest at a slower rate of speed over the next two days. The center of Lorena is anticipated to be near or over the southern Baja California peninsula later today. The main impact from Lorena appears to be the threat of locally heavy rainfall over parts of the southern Baja peninsula, where 3 to 6 inches of rain is possible (locally higher amounts possible). This rainfall could trigger life-threatening flash floods and mudslides. Tropical Storm Warning means that tropical storm conditions are expected somewhere within the warning area in this case within the next 12 to 24 hours. Lorena does have some opportunity to intensify before interacting with the southern Baja California peninsula...but time is running short. The cyclone is currently embedded in a moderate southwesterly vertical shear and moist environment and is traversing SSTs of 29c. However in about 24 hours the circulation of Lorena will be impacted by Baja California and restrict any further intensification.